Mainly sunny to start, then a few afternoon clouds. High 57F. Winds SE at 10 to 15 mph..
Cloudy. Low 39F. ENE winds shifting to WNW at 10 to 15 mph. College years can be the most magical time in one’s life. From parties, falling in love, and changing majors to the experience of stress and pressure that ensures friends for life, celebrating successes, and learning from failures - having a safe environment to do this is of the utmost importance. And for parents sending their children off to college, safety is usually a top concern. It is often the first time that their kids are on their own, living independently outside of the home. Choosing a school with a solid reputation for security and low potential for dangerous threats allows moms and dads to breathe easier once their kids ship off to earn a higher education. 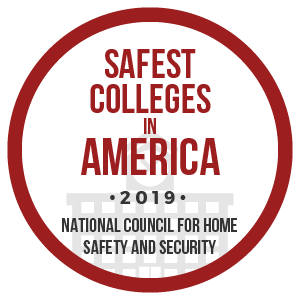 ​With this thought in mind, we compiled our list of the Safest Colleges in America. Due to the many different variables in play such as campus size, location, and culture, coming up with an accurate and fair ranking is a challenge. Some might say that campuses that rank high on a safety list have better PR in place instead of actually being safer. While these are valid concerns (and we certainly advise students and their parents to visit the colleges to see and feel the campuses for themselves), we do believe that we have been able to rank fairly and objectively. Not only have we taken data submitted to the FBI, we have also reviewed this data relative to the surrounding area of the campus. We have not taken any publications by the respective college into consideration for our list thus refuting the PR argument.